Custom Designed Waist Pack Medicine Case for AUVI-Q®, EpiPens®, Diastat®, ProAir® and other medicines needed for treating life threatening health conditions. Design your own case! Pictures shown are examples, although you can choose from one of the designs shown. As the parents of two kids with life threatening food allergies and asthma, we get the need to have medicine immediately accessible, in a fun and functional case that fits and protects the medicine while alerting those who need to know that there is medicine inside. The case also needs to fit our kids! If a case is uncomfortable or unattractive to your child, they will not want to carry it or wear it. When kids design their own case, they will naturally take ownership of it and want to carry it, take care of it and not lose it. Our studio is free of the top 8 food allergens, fragrances, toxic chemical cleaners, pets and smoke. We understand the importance of preventing reactions and take the same precautions as we would for our own children. Each case is custom sized to fit you or your child and the medicine that will be carried. The maximum cut for our waist pack pockets is 10” x 5”. If you are unsure of the size, please send us a picture of what will go in the case prior to placing your order. 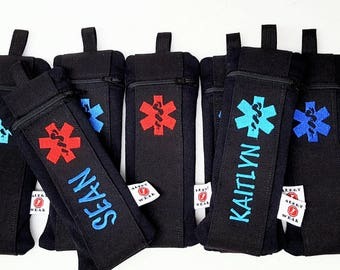 Each case comes with medic alert symbols on the sides so that adults and medical personnel know that the case contains life-saving medicine. The design that runs across the front is all about your child's passions and what will get them excited to wear the case! You can help them create a custom design that they will love! Custom sizing, custom design & belting options. ICE Panel = In Case of Emergency Embroidered Panel. The emergency panel is a flap that is sewn to the inside of the case. You can add 4 lines with 18-20 characters / spaces per line. Suggested information for the panel would be name, medical condition, basic emergency instructions and emergency contact information. 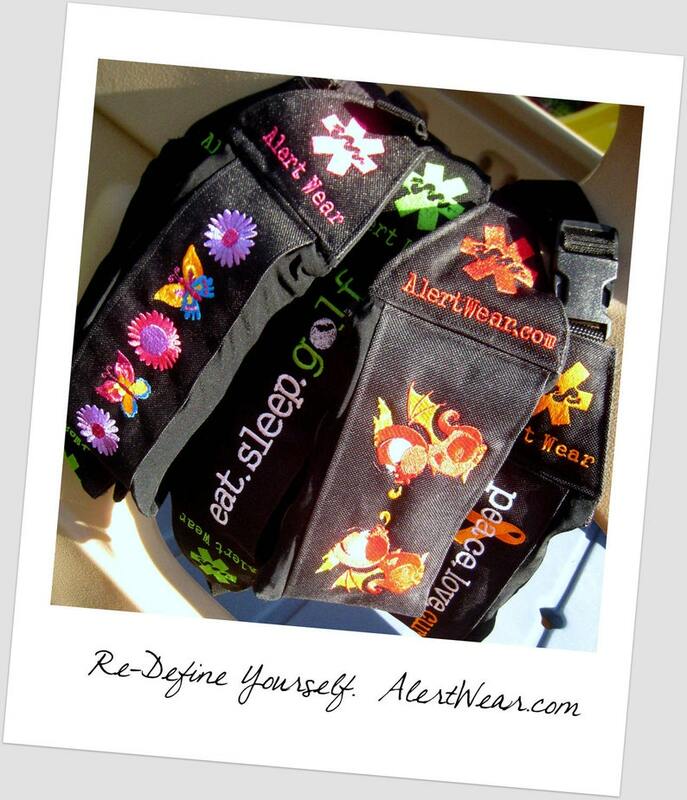 Alert Wear waist packs are exclusive copyrighted patterns of Alert Wear. Copyright 2006-2018. All rights reserved.